I needed to get to the other side of the fence easily. And this is an electric fence with a lot of pop! And other folks want to get in and out easy to spend time with the critters. Fooling with the electrics led to people forgetting to put things back the way they ought to be. So I need something easier than fooling with the electrics, so folks won't be temped to go that way. And it has to let people get to the other side, but not critters. And this fence is portable! So whatever I make needs to be able to move around as the fence is moved. I spent some time with pencil and paper and threw out the first four designs, and then .... 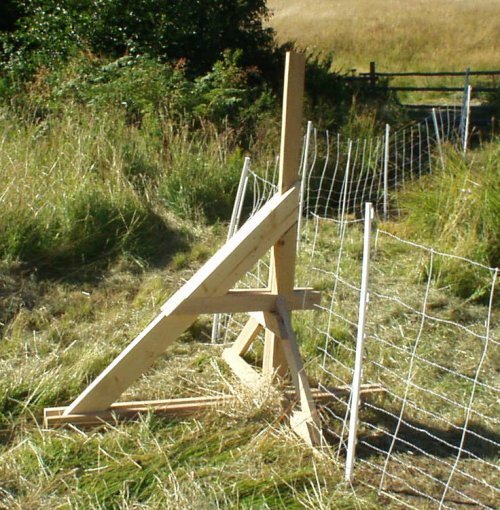 I made this ... portable fence stile. "Stile" - I had to have somebody tell me what I invented. While this might be the first portable stile, there have been lots of stiles in the past. The idea is that you stuff your foot into the triangle and hold on to the verticle stick to help keep your balance. 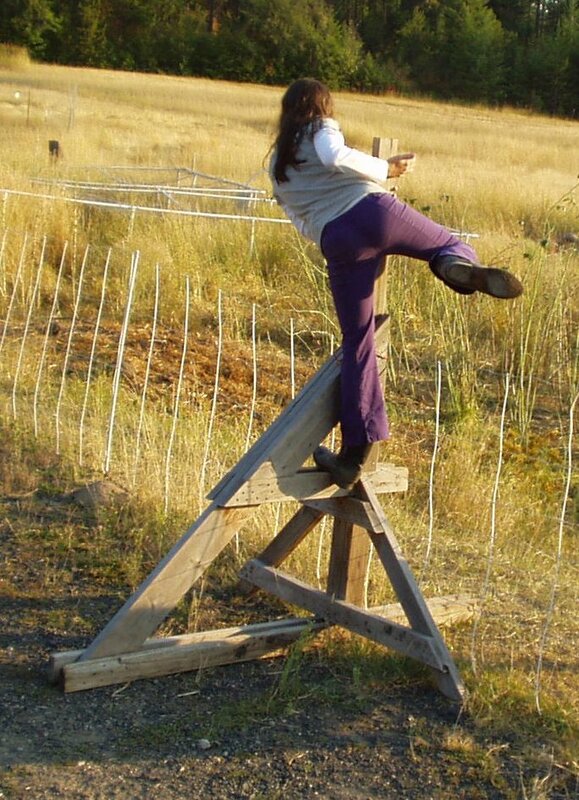 Then swing your other foot over the fence and stand on the piece of wood that sticks through the fence. Very fast! Very stable! And it is easy to drag around wherever your current electric fence is. To visit with me and others about this, click here.